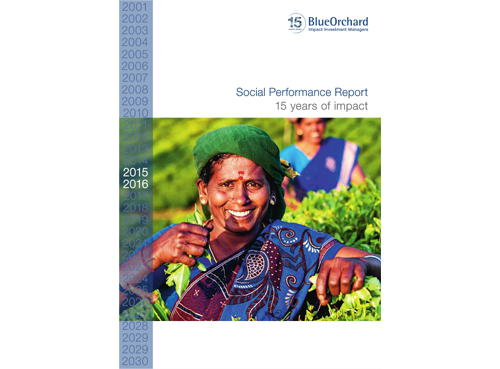 We are pleased to provide you with the most recent version of BlueOrchard’s Social Performance Report. Marking the occasion of BlueOrchard’s 15th anniversary as the first commercial manager of a microfinance debt fund, the report looks at the developments at BlueOrchard and the industry as a whole over this period from the perspective of social performance management. We highlight three microfinance institutions that we have continued to finance since 2001, our first year of operations, and telling their own stories, profile long-term micro-borrowers from each of these institutions. We then look at the evolution of our social performance assessment tool, SPIRIT, and how our analysis of social performance management has been developed and refined over the years. The report also examines new areas that BlueOrchard has expanded into, including education finance and environmental issues, including addressing the significant challenges posed by climate change.